San Vicente Ferrer is another patron saint, this time of the Valencian Community. He was less of a typical church figure and more of a politician and a XIV century intellectual, well known for his influence in the Papal elections. He is also known as one of the most-productive Catholic miracle-makers, and this aspect gets the most emphasis during the fiesta. Valencia hosts the home of San Vicente Ferrer as a museum. During the day of the fiesta it will be the centre of attention, extra active and free entry. It is an outstanding example of lush Valencian ceramic interior (even more amazing in a medieval household), and you can also find out about the life of San Vicente. If you are in Valencia during this fiesta, do come and see it. No fiesta in Valencia happens without lots of flowers. 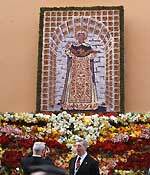 Today they will be brought to the home of San Vicente and beautifully arranged outside into an altar with the saint's portrait. The actual ceremony will go on from midday onwards, if you come you can enjoy the fiesta buzz and the atmosphere. If not, at least do come later to marvel at the completed flower job. See location above. 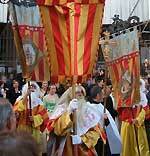 This procession is not great and can be missed, but if you have nothing else to do, why not... Various religious associations will march with standards from the Cathedral to the home of San Vicente. There will be a few traditional costumes and kids dressed up in medieval wear, but generally it is quite bleak and uneventful for a fiesta. At the end of the procession you will see the main city image (statue) of San Vicente carried on the shoulders of believers. This is the most entertaining part of the fiesta. Over the weekend prior to Monday 13 street altars will be constructed in the city. They are all different and gorgeous, well worth seeing. These altars are actually a theatre stage: closer to the evening they will all display plays by children under 13 years old. 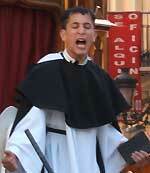 The plays will feature episodes of San Vicente's many miracles (in Valenciano, unfortunately). Boring? Far from it! Valencian kids are born for stage and you may find yourself laughing all day long without understanding a word. There will already be plenty of movement on Sunday before the fiesta. If you can get to Plaza de la Virgen at midday, you will see the ceremonial placement of the statue of San Vicente into the altar, and also some tradidional fiesta dancing.